This is certainly Zecharia Sitchin's best book for some years. It serves to bring together many of the various threads that he has written about over the last 30 years, as well as adding new material to his "Earth Chronicles" series. He also answers some of the questions that have arisen from his work, and sets out his clear position on the important issue of the timing of Nibiru. The content of the book covers some familiar ground to readers of his work. The ancient writings of the Levant form the basis of much of his deliberations, and he makes a better job of referencing the texts and work of previous researchers, upon whose work he has built so formidably. He also draws on various scientific reviews and articles, providing the usual eclectic Sitchinite mix of ancient and modern. Sitchin's focus here is the subject of Prophecy. He theorises that history has a cyclical pattern to it; that what has come before will occur again. His deliberations revolve around what time periods provide the context for these cycles. It comes down to a choice of Millennia, Nibiruan orbital 'Sars', and the Zodiacal Ages associated with the Precession of the Equinox. In the end, he opts for the latter, considering the end of the Age of Pisces as being perhaps fertile ground for a repeat of apocalyptic events which first occurred in the 21st Century BCE. In that regard, he studies Biblical Prophecy for clues to the future. As my readers will know, my research interests are themselves built upon Sitchin's work. His opinions about the nature and timing of Nibiru are of no small consequence to me, and I found the ideas he presents in this book very interesting indeed. In my correspondence with Zecharia, he has seemed open-minded about my brown dwarf theory regarding Nibiru/Marduk. Whilst no mention of this idea is made in 'The End of Days', there are several hints that seem to leave the door open to this possibility. Figure 43 clearly shows Nibiru as a planet of similar size to Jupiter (although in the text of the book Sitchin compares it to the size of Neptune). On page 110, Sitchin quotes Babylonian texts referring to Nibiru/Marduk as a Star/Planet, and highlights the rise of a 'Star Religion' in that culture. In the context of the heretical ancient Egyptian religion of Aten, Nibiru is associated with the 'Star of Millions of Years' (p118). This has an almost Nemesis quality to it, which I find quite intriguing. In other respects too, our work has coalesced. Sitchin considers the Messianic connotations of Nibiru, and the promise of the return of the ancient gods. This is a subject that I have covered many times. He again alludes to the association of the Cross symbol with Nibiru. Tellingly, there is no mention of an Exodus timeline for Nibiru. This concept has been very popular amongst Sitchinites and the followers of the work of Velikovsky in recent years. But Sitchin himself ignores this possibility entirely. Instead, he opts for an completely different timeline, one more in keeping with a careful reading of his early works. His cornerstone historical marker for the appearance of Nibiru is around 4000BCE, with the arrival of Anu on Earth; an event associated in the texts with the appearance of the gods' star. That date is not certain, and may even be more closely associated with the start of the Nippur calendar in 3760BCE. I would favour this, because I think that the calendars are reset with Nibiru (including ours?). Either way, the next historical appearance of Nibiru should have occurred in the 4 centuries before the birth of Christ...You would have thought. But Sitchin makes a calculated gamble. He argues that Nibiru came early, setting off a wave of Messianic prophecy and political intrigue prior to the predicted time. He argues that the sacking of Jerusalem in 560BCE marked the departure point for the remaining Anunnaki on Earth, an event linked to Nibiru's passage. This idea seems overly complex; a 'fit' that is designed to merge with Biblical events of - admittedly - some importance. This area of scholarly research is, of course, Sitchin's forte, but I'm minded to be cautious about too strong an association between the Anunnaki and the Monotheistic ancient cults of the Levant, like Judaism. To my mind, the later messianic fervour of the Graeco-Roman period is demonstrably more likely to have been the backdrop of the return of Nibiru. But, in the end, neither of our ideas fits the Sar period; we both have to adjust the orbital period; Sitchin reduces it, I increase it (or even multiply it up). 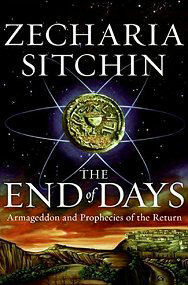 For those of you who are apocalyptically minded, Sitchin's last book might be a disappointment. Don't expect the 'star of millions of years' to return any time soon, folks. His only foretelling of doom builds upon his concept of a calamity which marks the repeating of (Sitchinite) history. As Iraq and Iran play a continuingly important focal point of world politics and conflict, so Sitchin sees the wheels of fate turning. Be hopeful that he is wrong! I'm personally glad that Sitchin wrote this book, and that his work has been taken up by such a prestigious publisher as HarperCollins. There are few such scholarly writers in the field of alternative knowledge, and this book stands as a testament to Zecharia Sitchin's talent for awe-inspiring ideas. I remain a big fan. Subtitled "Armageddon and Prophecies of the Return"